Wall Tie Material in Alva? Wall tie Installation in Alva? The Heli-Tie™ is a stainless-steel helical tie used to anchor building facades across Alva to structural members or to stabilize multiple-wythe brick walls. Level Up Foundation Repair in Alva. 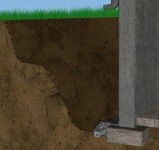 Wall Ties Foundation Repair Contractor in Alva, Oklahoma.